If you are a fan of Scream and Night of the Living Dead, it’s hard for me to imagine that you wouldn’t enjoy the hell out of Mimesis: Night of the Living Dead. Mimesis is a great word to use for the title of the film because not only is it befitting from the standpoint of its definition, but it also has a Resident Evil Nemesis sound to it. The movie is really just a zombie version of Scream. What happens when a group of people discover they are characters in the George Romero classic Night of the Living Dead? Mimesis is a simple thrill ride. It knows just how to straddle the line between remake and homage, giving us just enough changes in the situations to make it feel fresh while fully moving away from the original plot at the right time instead of beating the reimagining to a pulp. I’m amazed at some of the negative comments I’ve seen about the film online, especially since so many people trashed the 3D “remake.” Personally, it feels to me like this film rectifies that problem. You get a well-paced take on the classic with a twist, an awesome Satanic choral music score, perfectly delivered jump scares, and great gore. Some have complained about the CGI blood, but it is seriously minimal. Most of the blood you see is traditional special effects blood. And anyone who trashes this film because of the zombie makeup really needs to put the original Dawn of the Dead at the top of their list of worst zombie movies ever. 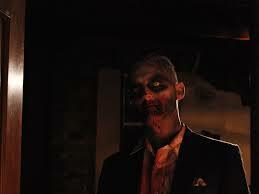 The makeup in Mimesis is actually eerie. Sid Haig has a small role in the film, which is convenient since he starred in the 3D remake that everyone hates. It’s refreshing to see him not playing a crazy evil dude. Also, the main black dude and the young white male character are both really cute! And finally, I so prefer that the film be made as an indie instead of by Hollywood, because it has a genuine feel to it since it is clearly made by fans of the classic. 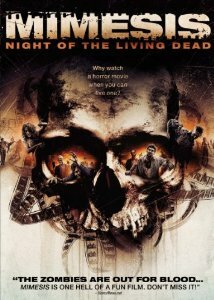 This entry was posted in Movie Times & Television Schedules - Staying Entertained, The Evil of the Thriller - Everything Horror and tagged George Romero, living dead, Mimesis: Night of the Living Dead, undead, Zombies. Bookmark the permalink.